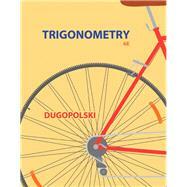 With an emphasis on problem solving and critical thinking, Mark Dugopolski’s Trigonometry, Fourth Edition gives students the essential strategies to help them develop the comprehension and confidence they need to be successful in this course. Students will find carefully placed learning aids and review tools to help them do the math. This is for my son in high school who is taking Trigonometry this year. The school recommended supplier was nearly $100 more expensive for the same book. It always pays to shop around! Trigonometry: 3 out of 5 stars based on 1 user reviews.